I had a nice surprise waiting for me in my pile of vacation mail: my order of MAME tokens from David Santoro. Very cool looking, and I'm really pleased with the nickel-plated ones. They're available at arcadetokens.com if you're interested in your own set. Give me a while to dig out of all the dirty laundry, and I'll post some news. Had fun in Disney World, and even got to play some pinball. Life is good. I'm going to be "offline" for a while, so don't expect any updates or new reviews. I'll be back before New Year's, however, and RetroBlast will ring in the new year with new reviews, news, and maybe even a contest or two...see ya after the holidays! I'm very impressed with all the support that has come to help with the project of designing a custom controller for a PS-2 gamer who happens to also be a quadriplegic. We've gathered over $470 in donations, and Game Cabinets Inc. has even offered to supply all the arcade parts necessary! Please visit this thread for information, and visit the "Donate to Sean" page to help out a fellow gamer in need! Pinball Posters from Treasure Cove! Treasure Cove is expanding their ever-growing product line again, this time adding pinball flyer posters in sizes up to 16" x 20" in either paper or canvas. They'll even do custom printing if you have a specific pinball flyer or other artwork in mind. I've got one of their Circus Voltaire 16" x 20" canvas prints, and it's top-notch quality. Now all I have to do is get it framed! What would the holidays at RetroBlast be without a holiday-themed review? Here it is: Christmas Tree Pinball, by WildSnake. A unique design that merges features from several pinball eras is only the first of many nice touches on this fun pinball sim. Santa himself would love to find this game in his stocking, I suspect. Version 2.0 of this unique MAME-oriented screensaver for Windows has just been released. The TB_Screensaver displays screenshots and marquees in one of nine formats, along with many customizable features. New this time is support for background images and colors, plus a lot of new fixes and features. Like the title says — check out this list over on PC World. I just finished up my review of PinBotz' pinball decals and instruction cards, and it's now available from the RetroBlast Reviews page. This is something of a personally embarrasing review to post, due to a stupid mistake I made during testing. What did I screw up? Check out the review to find out! David Santoro just let me know that the new MAME tokens have finally come in and he's started shipping out the preorders. They look great, and are available in both brass and nickel-plated brass. Check out this BYOAC thread for details, or hop on over to ArcadeTokens.com to order your own set. I know I'm looking forward to my set! I've written before about Sean, an avid gamer who happens to also be a quadriplegic, and his ongoing search for the perfect PS/2 controller for his needs. Well, no one (including myself) has been able to find an off-the-shelf controller that meets his needs, so the fine crew over at BYOAC have taken it upon themselves to build him the perfect controller! James McGovern (ace contributor to RetroBlast, a.k.a. "1hookedspacecadet") is doing a great job spearheading the design process. If you'd like to help out (with your mad building skillz or just a donation to help pay for parts), please visit this thread for information, and visit the "Donate to Sean" page to help out a fellow gamer in need! Direct from Pennyman: "Happy Holidays to everyone!! Two new episodes just added: As a bonus I added two episodes to the website last night. Hope they hold everyone over until I can get more posted in early 2005. Check out these two fine episodes hosted by fan favorite Taryn Southern with arcade champs Brian Kuh and Mark Alpiger!" Here's a very unique (ahem) one of a kind pinball machine: The Visible Woman: Orgasmic Pinball. Want to play it? You'll probably have to go the next Burning Man festival, the only time it's been shown to the public. I've just updated my review of the new SlikStik interchangeable balltop handles to include the new peartop handles as well. If you're looking for a great way to add some sparkle to your control panel (and some great gameplay as well), be sure to check out the new and improved review! Finally, I've managed to complete the written portion of my review of the Dream Arcades Side-by-Side Arcade Table (complete with an included PC and monitor). It's an easy-to-assemble "turnkey" system for MAME arcade goodness, but does it have what it takes to keep a MAME junkie satisfied? Check out the review. Update: I just discovered that I had made a pretty big boo-boo regarding pricing on this cab — it's $899 for the entire system (limited time), not $1399 (which is the price for the more powerful Athlon 2000+ system). This makes a big difference in my final conclusions, and the review has been updated accordingly. Boy, this situation has turned into a nasty can of worms: thanks to the intrepid investigation of "The Spade," we now know that not only is the rotate function non-functional in the Betson Multisync monitor, but it would require an almost complete retro-fit to get it to work! Apparently, team Kortek just never got around to implementing it. Michael Ginter pointed out the FrontX expandable port system to me, and while I had known of it before, it had never occurred to me that the FrontX system might make a great way to add USB ports and a headphones jack to the front of a cab! (duh.) Thanks, Michael! You know, sometimes the title just says it all...check out the full details here. Unfortunately, it's just for the PS/2 and X-Box, but, wow, what a cool looking controller! The Pelican Universal Wireless Arcade Stick (why does everything these days have to have a paragraph-long name?) is a 2.4ghz device that claims up to 200 hours on one set of AAA batteries. Does advertisting go down easier when it's in the form of a pinball game? Oh, yeah! Check out this online pinball game over at the Gigabyte site, designed to promote the features on their motherboards. A new direction for advertising? We can only hope. Thanks to Jim Wan for the link! It's beginning to feel a lot like Christmas, with all the recent package deliveries full of retrogaming goodies. Today's goodies are the new SlikStik Peartop Interchangeable handles. They look cool, and I'm hopefully going to be able to give them a good "torture testing" on my control panel this weekend! Oh, and I just noticed that SlikStik is now selling additional ball and pear tops separately, so now you can change the color of your joysticks whenever the mood strikes. Way to go, SlikStik! The Retro Remakes site has just posted their list of winners from their 2004 competition. 73 entries, all modern remakes of classic games. The contest entries have been reviewed, judged, and ranked for your reading (and playing) pleasure, so be sure and check it out! Believe it or not, the RetroBlast Joystick Roundup is almost finished. Thanks to a generous donation by RetroBlast reader Christopher Hart, I've got a new joystick to review: the Happ Controls Top Fire Button Compact Joystick. There's some discussion currently going on about this unique cab by Wil Turnbow on the BYOAC forums: is it the oldest known homemade "arcade" cab system out there? The cab is basically a Nintendo Entertainment System (NES) console combined with a great-looking arcade cabinet shell. It's been nominated for the BYOAC "Cabinet Hall of Fame," and the cab even got a writeup in Nintendo Power magazine. The coolest part? Wil made the cabinet way back in 1989, when he was just 13! There's a new pinball simulator in the works, one that looks like it will bring photo-realistic pinball action to an entirely new level. Future Pinball is an OpenGL project that looks like it will raise the bar for pinball simulations. I'm drooling already — hopefully they'll be able to meld with PinMAME for some truly awesome pinball action! A review of Simon Carless' new book Gaming Hacks: 100 Industrial-Strength Tips and Tools has just been posted to the RetroBlast Reviews Page. An amazingly broad collection of gaming hacks, tips, and strategies, does the book gell into a cohesive work? Be sure and check out the review! "It's official - PAPA is rebuilding in anticipation of holding the PAPA 8 World Pinball Championships in 2005. Cleanup work was completed in October 2004, building repairs will be complete in February 2005, and we expect the tournament to be held in August or September 2005." This is amazing news, considering the flood which trashed their headquarters and destroyed over 200 classic pinball machines just a few months ago. Longtime RetroBlast "spy" Matt Apuzzo wrote in to let everyone know he's created some finely-tuned MAMEWAH and Daphne configuration files that not only work well, they work well together. Daphne, for those who don't know, is an excellent emulator for laserdisc games (such as Dragon's Lair). If you're interested in Matt's high performance/low fat setup files, just drop him an email. Don't know what's up, but both sites seem to be down this morning. This was causing some delays for RetroBlast's News page as well, since my "newsbot" was trying to retrieve the CSS feed from MAMEworld. I've disabled my MAMEworld RSS feed until they're back up. Hopefully everything will be up and running soon. Update: MAMEworld is back up, so the newsfeed's back. Yes, another in the increasingly infrequent series of joystick roundup reviews, this time of the Happ Controls Ultimate joystick. Did I like it? Check out the roundup review over on the RetroBlast Reviews page — it shouldn't be too hard to figure out my feelings on this one! 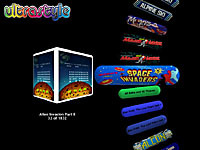 Just got word that a new update of UltraStyle has been released. If you aren't familiar with it, UltraStyle is a fairly new Windows front end for MAME, with some nice visual "eye candy" for selecting games. I've been playing around with it and am impressed. The new release has a few new features and some important bug fixes. The Lemon Amiga site has now officially opened. For Amiga gaming fans, it even includes an on-line game database. SlikStik is just cranking out the new products: they just announced their new interchangeable peartop handles on the BYOAC forums. Once again, the tops are swappable, with both stainless steel and anodized aluminum. If these are anywhere as nice as their new balltops, they're going to make a great Christmas present for a retrogamer! I received some very nicely done coin door stickers this week from Jeff Hanson. They are great looking high-quality stickers, and just happen to fit very nicely on a standard Happ coin door. If you're interested, Jeff's selling them: check out this thread on BYOAC for full details on how to get a set. Hey, our first "roundup" book review! RetroBlast's ace contributing writer James McGovern has just finished his reviews of both Supercade: A Visual History of the Videogame Age 1971-1984, and High Score! The Illustrated History of Electronic Games. Both are books any retrogamer would love, so find out what they're all about, already! SlikStik's new interchangeable balltop joystick handles replace their original "single-piece" stainless steel balltops with a new design that includes swappable balltops, adding optional anodized colored aluminum balls as well as the original steel balltop. But is it better? Check out the full review! Update: I forgot to add the video snippet. Fixed now. Fresh from the DHL delivery truck comes a set of SlikStik's new balltop joystick handles, complete with colored anodized aluminum balls (and a very heavy stainless steel ball as well!). I'm already very impressed with the balance of these sticks with the aluminum tops in place, and I can't wait to install them and try them out. Full review soon, I promise. I've been working with some other fellow Betson Multisync (review) owners this week to unravel the mystery of the non-functioning Tilt (Rotate) and v.Focus options in the Betson's onscreen menu (check out the BYOAC thread). Well, thanks to a visit to Betson by Dave K. we now know the answer: they were never implemented in the first place! This is truly strange news, and I'm going to see if I can find out more about it. I never had a problem with either focus or tilt on my Betson, so I never discovered the fact that those menu options were, in fact, broken. I'll post more (and update the review) once I find out more. Want a cheap conference table? How about a copier? No? How about 43,000 game cartridges and discs? Interested now? Acclaim, which went bankrupt recently, is now on the block. Everything from their corporate building to odd nicknacks are now up for bidding.